For my material alphabet, I was tasked with creating a texture that resembled the word “erase”. Immediately, I thought to get erasers and use the shavings to create the word. When I started to create my word, I experimented with shaving the pencil to create a disintegrating effect. I shaved down multiple pieces for bases of the letters. 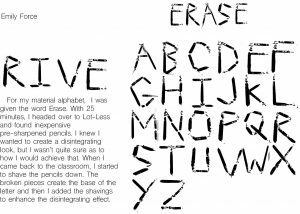 To create the final letter, I added chunks and shavings of the pencil to establish the “erase” effect. For my Chinatown inspired garment, I chose the word “rive” as its brand name. My theme for this project was history, so I mainly focused on the architecture I observed. I noticed how this place not only used the architecture from China, but it also used architecture from New York. With that in mind, I chose to create a garment that is inspired by both styles and how they clash and meld at the same time. Both styles are fighting with one another due to their contrast in shapes, but somehow it creates this distinctive aesthetic. I chose the word “rive” because it means to split or tear apart violently. It represents how Chinatown in Manhattan has ripped certain pieces of Chinese history and sporadically placed it throughout the town. Not only does it represent the war i saw between the architecture, but it also represents the garment visually. The skirt is meant to resemble blue and white China that is cracking. The newspaper from the top of the garment is shooting through the bottom to depict how even though the structure of the two pieces clash, they meld together to create a fully realized look.